We have a new spirit wear item to offer! Mrs. Tretinik has found a vendor that can create headbands, specifically, for our Marching Knights! They are handmade, locally, in Wixom. They are digitally printed, so they are guaranteed not to smudge or fade. There is a flyer you can print for further details, that also contains a picture of the logo. The headbands will be burgundy with "Marching Knights" in silver lettering. There are only a limited number of them available, so get yours today!!! They are only $10 a piece plus tax!!! We expect delivery of them by the end of September. If they are a popular item, then we can guarantee that you will be offered the chance to order them again in the spring, with a much larger quantity available! Payment can be made online at www.mkt.com/jcat-gear. 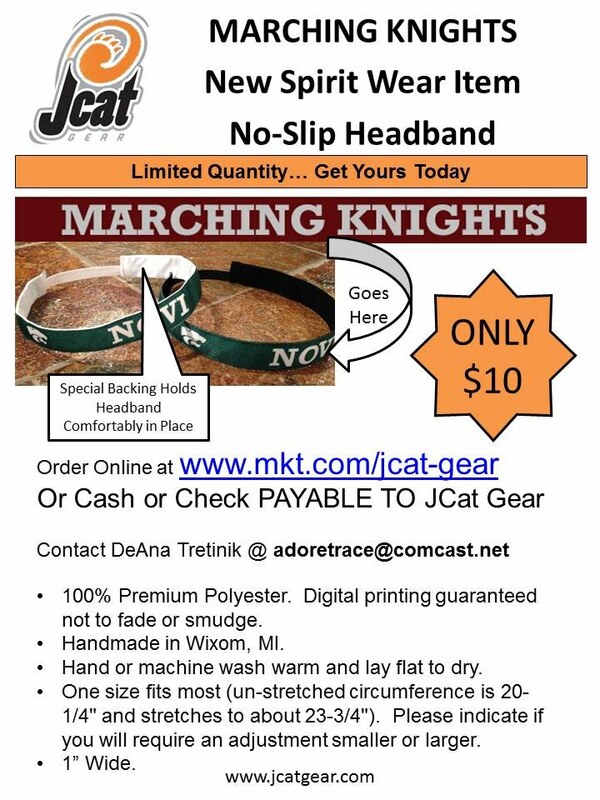 Just click on the "Marching Knights no-slip headband" link, listed on the first page, to place your order. PLEASE NOTE: the shipping is only free because they will be delivered to Mrs. Tretinik directly, then they will be distributed at school. If you would like the headband shipped directly to you, please contact Mrs. Tretinik before you place your order. Do not hesitate to contact her at adoretrace@comcast.net with any questions you may have.